Perkinsus olseni is a protozoan parasite that has been known to cause disease in abalone and, in chronic cases, can cause mortality in abalone. This parasite can also infect a number of other mollusc species. Perkinsus occurs in South Australian waters. It is a notifiable disease, meaning it must be reported. This disease does not pose a human health risk. 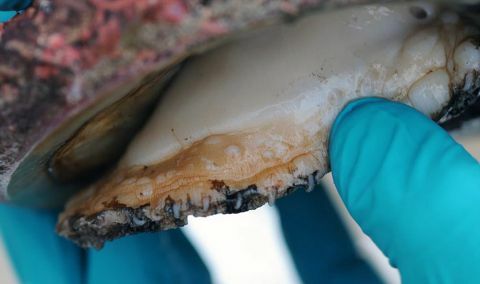 Abalone infected with Perkinsus are safe to eat. Abalone infected with Perkinsus. Source: South Australian Research and Development Institute PIRSA. Brown, sphere-shaped abscesses containing a creamy brown or cheese-like deposit in the foot and mantle of blacklip and greenlip abalone. Abscesses can be up to 8mm in diameter, or the size of a small pea / sultana. Thin, watery tissue with a pale digestive gland. Nodules in the mantle and gills. It is important to note: The disease may still be present, even if none of the above signs are visible. Remove all fishing and dive gear from the water and store it on board your vessel. Quarantine the suspect abalone, including shell and gut, inside a plastic container or bag so the disease does not spread. Immediately return to shore and phone the Fishwatch hotline on 1800 065 522. The hotline operates 24 hours per day, seven days per week. A Fisheries Officer may ask you to provide a sample. Dispose of remaining infected abalone, including the shell and gut, in household rubbish. Do not dispose of it at sea. Wash your hands with soapy fresh water. On land, thoroughly rinse your fishing and diving gear with soapy freshwater and allow to fully dry before re-using. Live abalone must not be brought into South Australia from interstate, unless within the requirements of the Livestock Act 1997. Do not use dead abalone or abalone gut for bait or berley. Remember, dead abalone or abalone gut purchased as seafood for human consumption may have been sourced from outside of South Australia. By using it in South Australian waters, you risk spreading aquatic diseases. If you find dead abalone, especially clusters of shells, report it to Fishwatch on 1800 065 522. Carefully follow the above decontamination guidelines if you suspect you or your fishing / diving gear has come into contact with infected abalone. Dispose of abalone shell, meat and gut in household rubbish, not at sea. Perkinsus olseni is a notifiable disease and must be reported. Report suspected cases immediately to Fishwatch on 1800 065 522. The hotline operates 24 hours per day, seven days per week. Learn how to help protect our aquatic environments from the introduction of disease on the Department of Agriculture and Water Resources website.